Freedom Rockz: Free Quart of Paint! Awesome! Free Quart of Paint! Awesome! 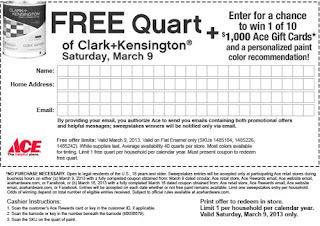 Free Quart of Paint Saturday March 9th, 2013. Oh you all know I will be using this one for sure lol Click the link below to print your coupon. Take it to your local Ace to redeem offer valid Sat. March 9th, 2013 only.